In this podcast Ricardo discusses the project and crisis management to seize the Alemão (German) Complex in Rio de Janeiro-Brazil, one of the most violent slums, dominated by drug dealers and gangs. He discusses the coordination of actions, speed and strategy in the successful management of the crisis. Paul McCartney Concert in Sao Paulo and Project Management for Mega Events. In this second podcast of series CAPM, Ricardo talks about the test and certification process. He explains that the test has 150 questions and the CAPM credential is valid for five years, Ricardo also talks of the most knowledge areas charged in the test. 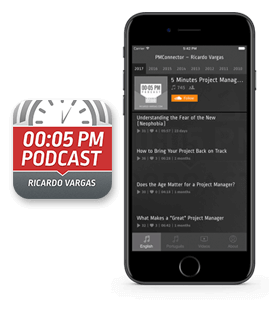 In this first podcast of the series, Ricardo talks about the importance of CAPM certification (Certified Associate in Project Management) and for whom it is directed. He explains that this certification is intended to complement the skills of the project team, but can help sponsors better understand the universe of projects. Ricardo also talks of the main functions of the professional certified in CAPM.